Once the death strip separating the north-east district of Prenzlauer Berg from north-west Gesundbrunnen, now a public park space with patches of green and brown grass atop muddy, dusty and warn paths of dirt, bottle caps and discarded cigarette butts. The long and straight dirt path running through the middle of the park. An overgrown meadow in the summer littered with abandoned disposable barbeques of picnics past, laden with excited dogs and running children, row upon row of bikes and sprouting sage running down the hill is a stark contrast to the cold and omniscient reminder of dark, wintery afternoons with enough glühwein to keep you partially warm and not nearly as many crowded elbows to dodge. 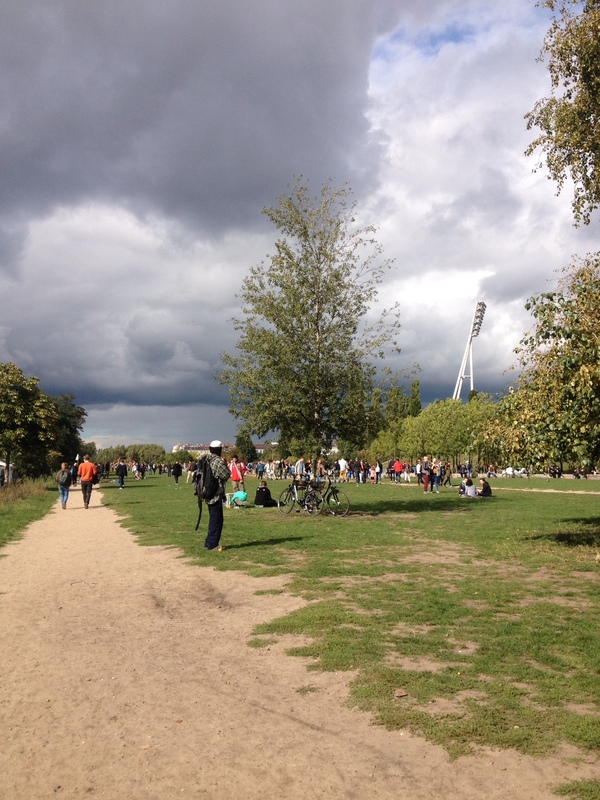 Mauerpark offers a mystery and wonderment that encapsulates the epitome of leisure in Berlin. Swings decorate the top of the Mauerpark hill in the background of the famous karaoke auditorium. A quiet sleepy hollow for dog walkers and toddlers on bikes during the week, Mauerpark turns into another world come Sunday when the bustling Flomarkt opens its doors. On the western side the park delivers nostalgic junk, prized second-hand originals, food from all over the global and of course beer to families, bargain hunters, hungover youngsters still on their way home from Saturday night and confused tourists. On the east side, eager karaoke fans fill the stone auditorium in the shadow of Friedrich-Ludwig-Jahn-Sportpark with pre-show entertainment from local magic acts as cigarette and beer carts meander through the crowds which can peak at a few thousand in summer. Mauerpark is a hot spot for abandoned bikes and for the sale of many stolen bikes. It is hard to call Mauerpark beautiful with its discarded past, derelict present and doomed commercial future but it is far from ugly. The space is littered with trash but spoilt with music; a folk festival every week with rock bands, techno DJs, folk singers and alternative concepts are dotted throughout the park inviting crowds and dancers of all sizes as musicians compete with one another for the public’s support. Just one of the entrances to the park littered with flyers and bike locks. The scent of wurst and stale beer waft over the park alongside tasty food trucks from bao burgers and gözleme to currywurst and bruschetta topped off with coffee carts, wine guys and tap beer heaving with hungry visitors. Sunday in Mauerpark illustrates the carefree and whimsical side of Berlin alongside the backdrop of abandoned bikes, the reminisce of parties long over and the flowing street art in fluoro, black and gold sprayed on structures surrounding the park. Vibrant street art along the east wall of the park. ← Cold War cuisine in Berlin Part 1.